The Supreme S238 is large enough for you and 15 of your closest friends. The modified Deep-v Hull design, complemented by available QuickFill Ballast, Plug and Play Ballast, QuickSurf System and pushed by GM Marine Crusader Engines from PCM, gives you all the tools you need to create your perfect waves and wakes. The new SeeTouch® Dash System supports relaxed fun, as this touch screen monitors and controls almost every boat system, intuitively. The S238 performance, style and functionality is supported by the strength of the vacuum infusion process, and your peace of mind is supported by our 5-year warranty. 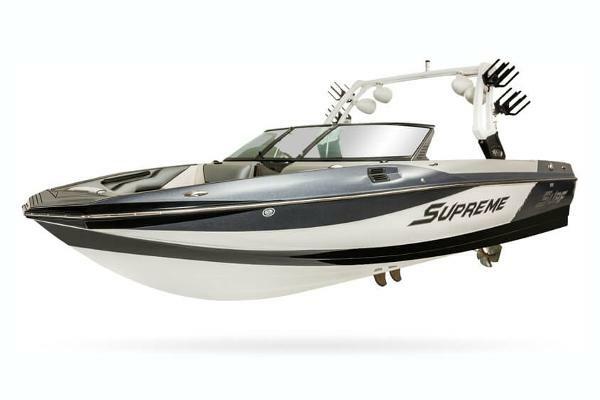 Supreme Boats is a Correct Craft Company. $643 PER MONTH! 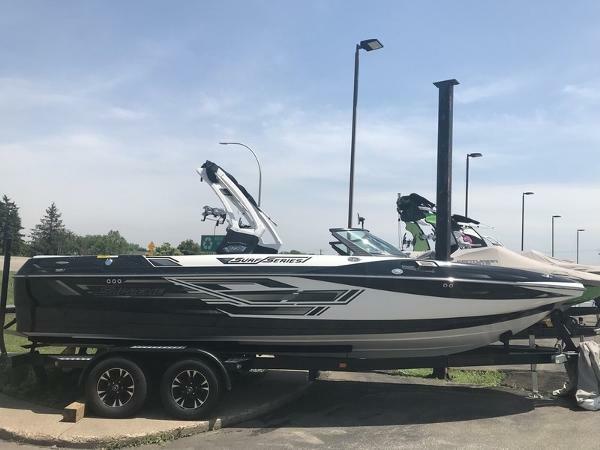 2018 Supreme Boats S238 WHITE OCTO TOWER, SURF PROP, TRON GRAPHICS, FRICTION FLOORING, SHARKFIN DECK KIT, SWIVEL LOWER RACKS, BOW BAG & HARD TANKS, QUICK FILL, PLUG-N-PLAY REAR BAGS, QSP, BIMINI W/STORAGE, 2 EXTRA CLEATS, HEATER, WIND BLOCK, ZERO OFF, TANDEMBLACK TRAILER, EXTREME TOP COAT, 15" STD WHEELS, SPARE RACK, REAR STEPS, GUIDE POLE COVERS At nearly 24-feet, the 2018 Supreme S238 is large enough for you and 15 of your closest friends. The modified Deep-v Hull design, complemented by available QuickFill Ballast, Plug and Play Ballast, QuickSurf System and pushed by GM Marine Crusader Engines from PCM, gives you all the tools you need to create your perfect waves and wakes. The new SeeTouch® Dash System supports relaxed fun, as this touch screen monitors and controls almost every boat system, intuitively. The S238 performance, style and functionality is supported by the strength of the vacuum infusion process, and your peace of mind is supported by our 5-year warranty. Supreme Boats is a Correct Craft Company.HIGH PERFORMANCEThe Deep-v Hull is the foundation of the S238’s wake performance, but the seamless integration of handling and power make it a World Class Towboat. This hull design also creates a better rough water ride by cutting through the chop with its acutely angled keel. With the perfect placement of the new large SmoothTrack Tracking Fin and an option of a second fin, the S238 stays straight even with a progressively cutting rider in tow. The 52 square inches of fin surface area also act as an amazing pivot point under the S238, significantly improving slow and high speed handling as well as navigating in reverse. Powered by GM Marine Crusader Engines from PCM, the S238 comes standard with the forceful EX3 engine, optimized by a 1.72 X 1 gear reduction and specific propping for instantaneous take-offs. You can upgrade to the GM Marine H5DI or H6DI by PCM with S-Force for even more pulling power. Supreme Force (S-Force) is torque optimized propping and gearing to fully utilize the extremely efficient power of a direct injection GM engine. With 5 years of warranty these engines provide as much piece of mind as they do mind-blowing performance.S238 SPECS Length w/out Platform 23' 8? Beam 102? Draft 32? Weight 4,700 lbs Fuel Capacity 63 gals Seating Capacity 16 Ballast 1,100 lbs (STD) + 1,600 lbs (OPT) = 2,700 lbs Engine GM Marine EX3 by Crusader 1.72:1 GR Engine Warranty 5 Years COOL STYLEYou will be proud to be seen in this Supreme. The modified V-bow is wide, deep and welcoming yet follows a traditional style. Supreme’s new Skylon S5 Tower with patent-pending overlock adds to the style of the S238 with its forward sweeping lines. The tower also introduces a black wrinkle-coated element that is matched on exterior by a new fresh air vent and throughout the interior in by new grab handles. 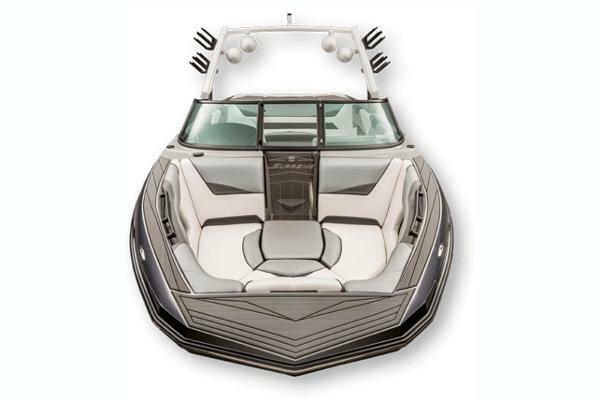 The body lines along the sides of the boat are stylishly subtle, but can be punched up to aggressive with gel coat scheme and color choices.From the dock you will notice the intricate gel coat pattern and stylized graphics. With the choice of two distinct gel coat schemes and 25 colors, including 12 available metal flakes, you can make the Supreme S238 uniquely you. The customizable cool spills into the interior with an abundance of available colored and textured Spradling vinyl accents throughout. Customize your dash with colored accents and stitching. The flooring options in the S238 range from the standard Friction Snap-out Mat to a Luxury Logo Carpet to the cool Supreme-branded non-skid flooring from Gator Step. $643 PER MONTH! 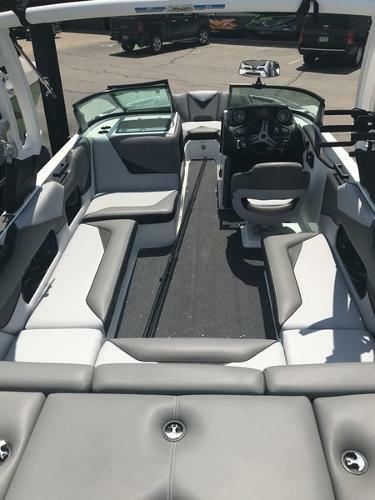 2018 Supreme Boats S238 WHITE OCTO TOWER, SURF PROP, TRON GRAPHICS, FRICTION FLOORING, SHARKFIN DECK KIT, SWIVEL LOWER RACKS, BOW BAG & HARD TANKS, QUICK FILL, PLUG-N-PLAY REAR BAGS, QSP, BIMINI W/STORAGE, 2 EXTRA CLEATS, HEATER, WIND BLOCK, ZERO OFF, TANDEMBLACK TRAILER, EXTREME TOP COAT, 15" STD WHEELS, SPARE RACK, REAR STEPS, GUIDE POLE COVERS At nearly 24-feet, the 2018 Supreme S238 is large enough for you and 15 of your closest friends. The modified Deep-v Hull design, complemented by available QuickFill Ballast, Plug and Play Ballast, QuickSurf System and pushed by GM Marine Crusader Engines from PCM, gives you all the tools you need to create your perfect waves and wakes. The new SeeTouch® Dash System supports relaxed fun, as this touch screen monitors and controls almost every boat system, intuitively. The S238 performance, style and functionality is supported by the strength of the vacuum infusion process, and your peace of mind is supported by our 5-year warranty. Supreme Boats is a Correct Craft Company.HIGH PERFORMANCEThe Deep-v Hull is the foundation of the S238’s wake performance, but the seamless integration of handling and power make it a World Class Towboat. This hull design also creates a better rough water ride by cutting through the chop with its acutely angled keel. With the perfect placement of the new large SmoothTrack Tracking Fin and an option of a second fin, the S238 stays straight even with a progressively cutting rider in tow. The 52 square inches of fin surface area also act as an amazing pivot point under the S238, significantly improving slow and high speed handling as well as navigating in reverse. Powered by GM Marine Crusader Engines from PCM, the S238 comes standard with the forceful EX3 engine, optimized by a 1.72 X 1 gear reduction and specific propping for instantaneous take-offs. You can upgrade to the GM Marine H5DI or H6DI by PCM with S-Force for even more pulling power. Supreme Force (S-Force) is torque optimized propping and gearing to fully utilize the extremely efficient power of a direct injection GM engine. With 5 years of warranty these engines provide as much piece of mind as they do mind-blowing performance. S238 SPECS Length w/out Platform 23' 8? Beam 102? Draft 32? Weight 4,700 lbs Fuel Capacity 63 gals Seating Capacity 16 Ballast 1,100 lbs (STD) + 1,600 lbs (OPT) = 2,700 lbs Engine GM Marine EX3 by Crusader 1.72:1 GR Engine Warranty 5 Years COOL STYLEYou will be proud to be seen in this Supreme. The modified V-bow is wide, deep and welcoming yet follows a traditional style. Supreme’s new Skylon S5 Tower with patent-pending overlock adds to the style of the S238 with its forward sweeping lines. The tower also introduces a black wrinkle-coated element that is matched on exterior by a new fresh air vent and throughout the interior in by new grab handles. 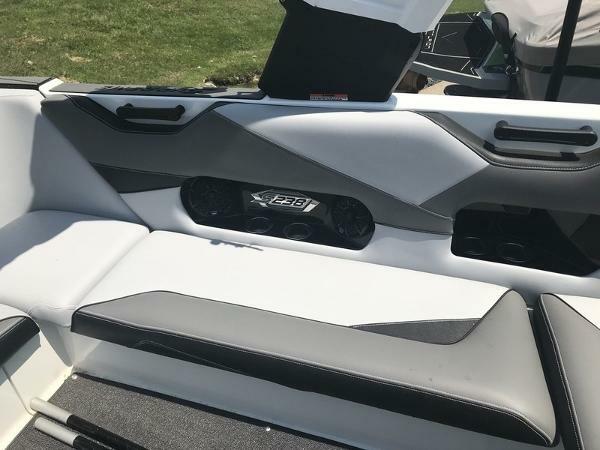 The body lines along the sides of the boat are stylishly subtle, but can be punched up to aggressive with gel coat scheme and color choices.From the dock you will notice the intricate gel coat pattern and stylized graphics. With the choice of two distinct gel coat schemes and 25 colors, including 12 available metal flakes, you can make the Supreme S238 uniquely you. The customizable cool spills into the interior with an abundance of available colored and textured Spradling vinyl accents throughout. Customize your dash with colored accents and stitching. The flooring options in the S238 range from the standard Friction Snap-out Mat to a Luxury Logo Carpet to the cool Supreme-branded non-skid flooring from Gator Step. $643 PER MONTH! 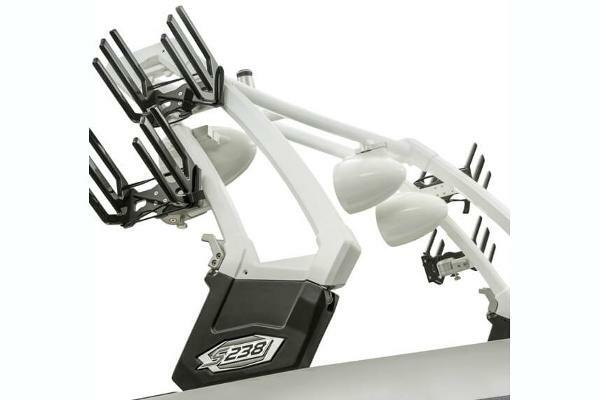 2018 Supreme Boats S238 WHITE OCTO TOWER, SURF PROP, TRON GRAPHICS, FRICTION FLOORING, SHARKFIN DECK KIT, SWIVEL LOWER RACKS, BOW BAG & HARD TANKS, QUICK FILL, PLUG-N-PLAY REAR BAGS, QSP, BIMINI W/STORAGE, 2 EXTRA CLEATS, HEATER, WIND BLOCK, ZERO OFF, TANDEMBLACK TRAILER, EXTREME TOP COAT, 15" STD WHEELS, SPARE RACK, REAR STEPS, GUIDE POLE COVERS At nearly 24-feet, the 2018 Supreme S238 is large enough for you and 15 of your closest friends. The modified Deep-v Hull design, complemented by available QuickFill Ballast, Plug and Play Ballast, QuickSurf System and pushed by GM Marine Crusader Engines from PCM, gives you all the tools you need to create your perfect waves and wakes. The new SeeTouch® Dash System supports relaxed fun, as this touch screen monitors and controls almost every boat system, intuitively. The S238 performance, style and functionality is supported by the strength of the vacuum infusion process, and your peace of mind is supported by our 5-year warranty. Supreme Boats is a Correct Craft Company. HIGH PERFORMANCE The Deep-v Hull is the foundation of the S238’s wake performance, but the seamless integration of handling and power make it a World Class Towboat. This hull design also creates a better rough water ride by cutting through the chop with its acutely angled keel. With the perfect placement of the new large SmoothTrack Tracking Fin and an option of a second fin, the S238 stays straight even with a progressively cutting rider in tow. The 52 square inches of fin surface area also act as an amazing pivot point under the S238, significantly improving slow and high speed handling as well as navigating in reverse. Powered by GM Marine Crusader Engines from PCM, the S238 comes standard with the forceful EX3 engine, optimized by a 1.72 X 1 gear reduction and specific propping for instantaneous take-offs. You can upgrade to the GM Marine H5DI or H6DI by PCM with S-Force for even more pulling power. Supreme Force (S-Force) is torque optimized propping and gearing to fully utilize the extremely efficient power of a direct injection GM engine. With 5 years of warranty these engines provide as much piece of mind as they do mind-blowing performance. S238 SPECS Length w/out Platform 23' 8? Beam 102? Draft 32? 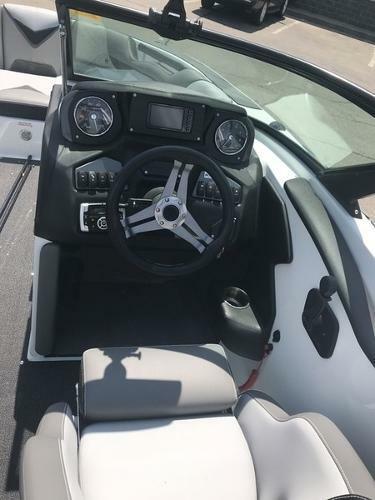 Weight 4,700 lbs Fuel Capacity 63 gals Seating Capacity 16 Ballast 1,100 lbs (STD) + 1,600 lbs (OPT) = 2,700 lbs Engine GM Marine EX3 by Crusader 1.72:1 GR Engine Warranty 5 Years COOL STYLE You will be proud to be seen in this Supreme. The modified V-bow is wide, deep and welcoming yet follows a traditional style. Supreme’s new Skylon S5 Tower with patent-pending overlock adds to the style of the S238 with its forward sweeping lines. The tower also introduces a black wrinkle-coated element that is matched on exterior by a new fresh air vent and throughout the interior in by new grab handles. The body lines along the sides of the boat are stylishly subtle, but can be punched up to aggressive with gel coat scheme and color choices. From the dock you will notice the intricate gel coat pattern and stylized graphics. With the choice of two distinct gel coat schemes and 25 colors, including 12 available metal flakes, you can make the Supreme S238 uniquely you. The customizable cool spills into the interior with an abundance of available colored and textured Spradling vinyl accents throughout. Customize your dash with colored accents and stitching. The flooring options in the S238 range from the standard Friction Snap-out Mat to a Luxury Logo Carpet to the cool Supreme-branded non-skid flooring from Gator Step. $572 PER MONTH! 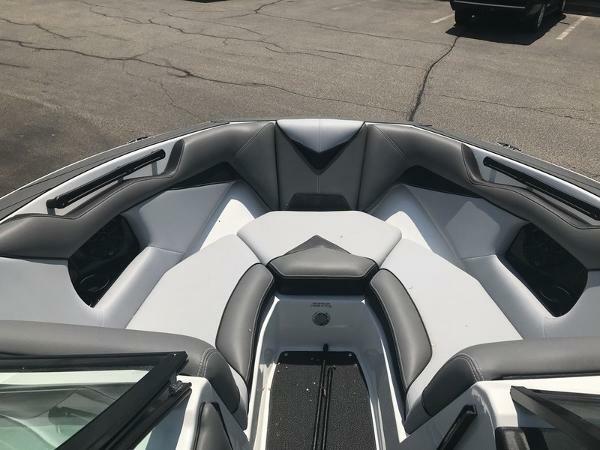 2017 Supreme Boats S238 PCM GM MARINE L96, OCTO TOWER, HIGH ALT PROP, OCTO TOWER BLACK, SHARKFIN FLOORING W/DECK KIT, 2 PAIR WETSOUNDS REV 8, SWSC PACKAGE, QUICK FILL BALLAST, BIMINI W/STORAGE, COVER, SEETOUCH DASH, 2 EXTRA CLEATS, REAR WALK OVER, HEATER, UNDERWEATER LED, WIND BLOCK, ZERO OFF, TANDEM CHARCOAL TRAILER, ELECTRIC BLUE FENDERS, GEAR 740B WHEELS W/ ELECTRIC BLUE INSERTS, SPARE RACK ONLY, ALUMINUM TREAD PLATES, LOADING LIGHTS, REAR STEPS. PRICE PLUS FREIGHT AND PREP The 2017 S238 is a 23-foot 8-inch wake surfing towboat that offers more fun for as many as 16. Make it your own with customizable colors. The Deep-v Hull, complemented by the QuickFill Ballast, Plug and Play Ballast and the available QuickSurf System, pushed by GM Marine Crusader Engines from PCM give you all the tools you need to power your fun. The Octo® Tower by Skylon towers above the rest with the style and strength of octagon-shaped tube, a USA-casted base and weightless fold secured by a patent-pending overlock mechanism commanded by a compression latch. Strength and longevity are built in to this beauty, so you can be confident in its durability. COOL STYLE You will be proud to be seen in this Supreme. The modified V-bow is wide, deep and welcoming yet follows a traditional style. Supreme’s new Skylon S5 Tower with patent-pending overlock adds to the style of the S238 with its forward sweeping lines. The tower also introduces a black wrinkle-coated element that is matched on exterior by a new fresh air vent and throughout the interior in by new grab handles. The body lines along the sides of the boat are stylishly subtle, but can be punched up to aggressive with gel coat scheme and color choices. From the dock you will notice the intricate gel coat pattern and stylized graphics. With the choice of two distinct gel coat schemes and 25 colors, including 12 available metal flakes, you can make the Supreme S238 uniquely you. The customizable cool spills into the interior with an abundance of available colored and textured Spradling vinyl accents throughout. Customize your dash with colored accents and stitching. The flooring options in the S238 range from the standard Friction Snap-out Mat to a Luxury Logo Carpet to the cool Supreme-branded non-skid flooring from Gator Step.  Features may include: GM Marine EX3 by Crusader 1.72:1 GR (5 Year Warranty) Engine Water Intake Strainer Gel Coat Scheme Split Crusader/PCM Digital Speed Control w/ Paddle Wheel Input 4 Pull up Cleats 6? Stainless Steel Rub Rail Black Rear View Mirror (STD) Depth Finder Fiberglass Swim Step Supreme Friction Non-Skid Floor Kit Charcoal 2nd Battery Package with Control Center Center Wake Plate One SmoothTrac Fin Pro S5 Tower System ( Black or White) Supreme “Quick Fill” Ballast System Bow Ballast Hard Tank Clarion CM-2 Bluetooth, CD, AM/FM USB Stereo, w/6 Wetsounds WS65B Speakers, and Wetsounds HT-6 Amp Tandem Axle Trailer w/Disc Brakes both Axles, Alum Wheels, LED Lighting, Swing Tongue, Stainless Retractable Transom Straps, Aluminum Fender Steps, Winch and Strap.